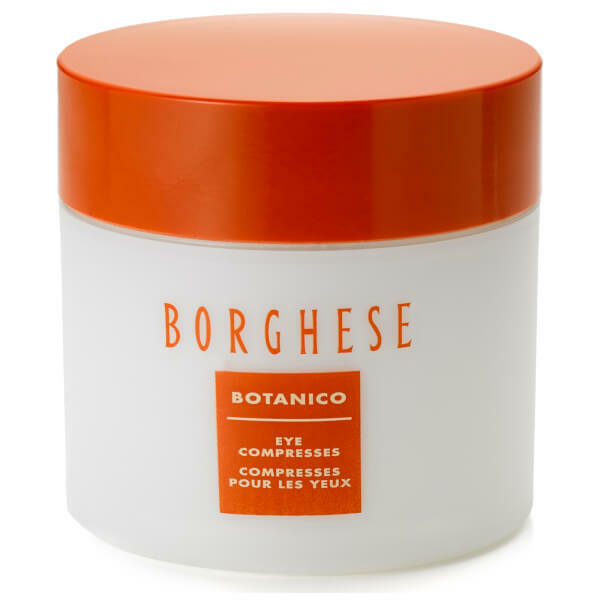 Refresh and rejuvenate tired, weary eyes with Borghese Botanico Eye Compresses, a cooling, hydrating eye treatment that helps to soften and soothe delicate, fatigued skin. Combining antioxidant Green Tea with Goldenseal and Eyebright extracts, the saturated pads instantly cool and refresh skin around the eyes, softening and relieving to lend tired eyes an energised and wide awake feeling. After use, skin looks clarified and radiant. Use on clean skin. Lie down and relax with eyes closed. Place one pad over each eye. Remove after 5-10 minutes, keeping eyes closed, pat excess gel around eye area. Dispose of pads after each use. Water (Aqua), Hamamelis Virginiana (Witch Hazel) Water, Propylene Glycol, Ppg-24-Glycereth-24, Hydrastis Canadensis (Goldenseal) Extract, Euphrasia Officinalis Extract, Camellia Sinensis Leaf Extract, Hydrolyzed Collagen, Hyaluronic Acid, Collagen Amino Acids, Adenosine Triphosphate, Sea Salt (Maris Sal), Mineral Salts, Trisodium Edta, Carbomer, Disodium Edta, Edta, Quaternium-15, Triethanolamine, Diazolidinyl Urea, Phenoxyethanol, Methylparaben, Propylparaben, Ethylparaben, Butylparaben, Blue No. 1 (Ci 42090).